The XC60 is a mid-size sports utility crossover based on the S60 sedan. For 2015, it presents a cleaner face to the wind thanks to a more streamlined front fascia. 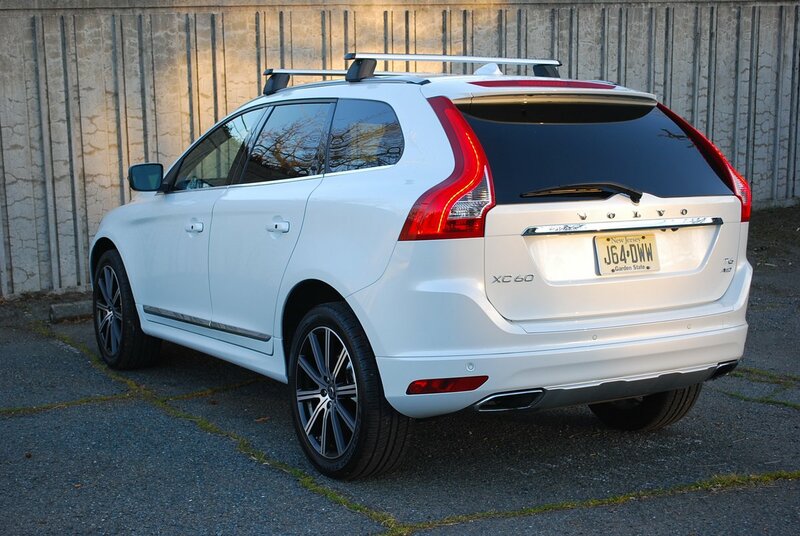 In conjunction with this newly lowered snout, Volvo stylists have visually elevated the XC60′s tail. Decisive side creases underline the aggressive stance, making this Volvo look like it’s about to pounce on prey. The illusion is not unsupported, because a powerful and willing twin-scroll turbo straight 6 lies under the hood, ready to devour pavement with alacrity. 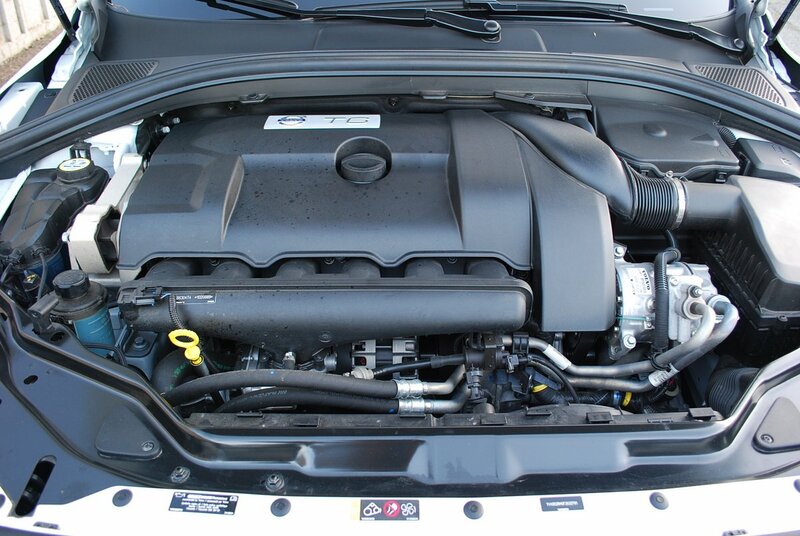 The 3.0 liter engine produces 300hp and 325lb.-ft. of torque, with full torque infusion coming on line at just 2100rpm. Coupled to a 6-speed automatic with standard paddle shifts, the XC6 T6 jumps when prodded, despite its substantial 4,275lb. curb weight. While Volvo’s all-wheel-drive system is not designed for serious off-road work (there’s no transfer case), it will insure splendid traction on all forms of pavement. Our test XC sported $1,000 optional 20 inch diameter “Titania” alloys which mounted premium Pirelli Scorpion Zero tires measuring 255/45R20 at each corner. Despite their enormous diameter, these rims, which replace standard 18 inch wheels, look surprisingly delicate thanks to their almost invisible rim bead connected to 10 wafer-thin double spokes. The overall visual effect is similar to that of a Mattel Hot Wheels dream toy. The interior shares the exterior’s exciting visuals, with a two-tone seat leather treatment adding Swedish modern sophistication to the $900 optional Sport Seating surfaces. In fact, if you are a fan of Mid Century Modern design, you will love the simplistic integration of materials and surface treatments in the cabin. For example, the center stack, a design nightmare in so many other SUVs, is here cleanly arrayed, devoid of frills, and operationally sound, with all key HVAC and Entertainment system functions accessible through separate buttons rather than menu driven nonsense. Particularly nice is the standard issue “Laminated Power Roof with Power Sunshade. This oversize opening can be configured in any number of useful ways, ranging from tilting the front panel, to sliding the shade wide open over all interior seats. 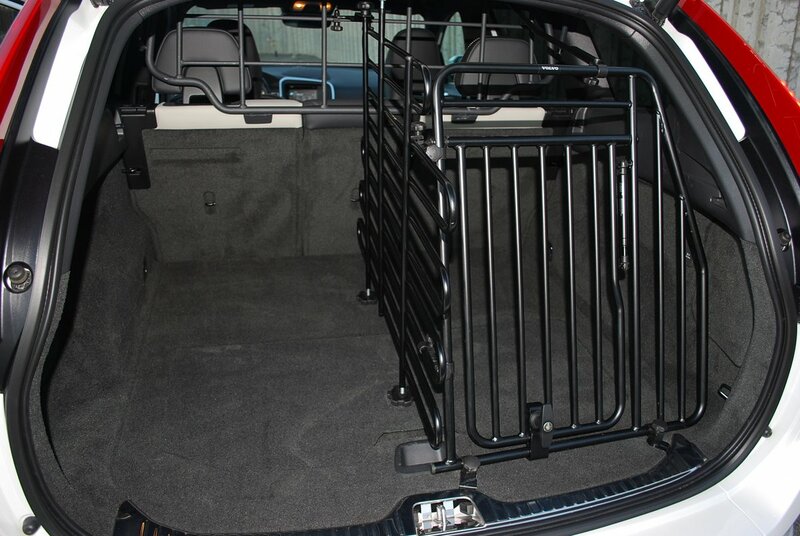 Volvo equipped the cargo area of our sports utility with a dog kennel apparatus that made the interior seem more like a Swedish police cruiser than a family wagon. Vertical and horizontal metal bars (called a “Safety Grill”) not only segregated the rear compartment from the passenger area, but also created a structure (called a “Load Organizer and Dog Gate”) large enough to house a medium size pet. With its hydraulic lift door, the Load Organizer proved very handy for safe transport of fragile items. The downside to the array of black metal bars is poor rear vision, and a sepulchral feel to the interior. The expensive “Platinum” option, which boosts sticker price by $4,400, brings several important safety measures into play. 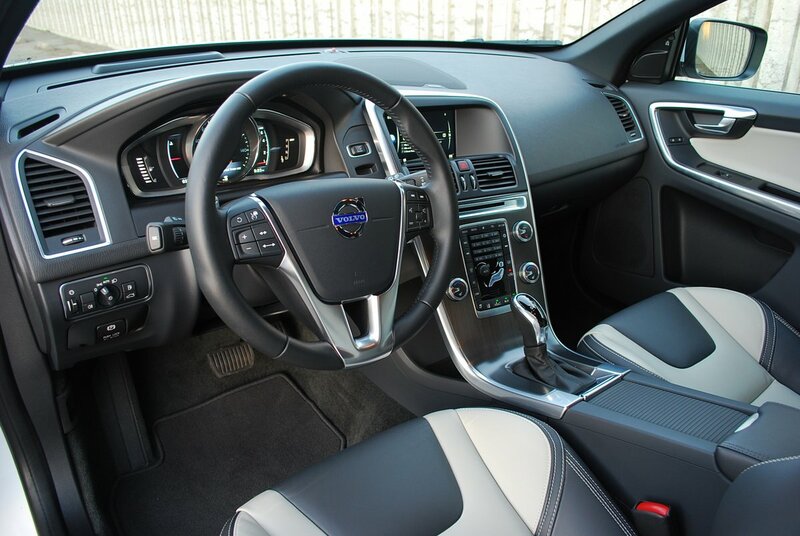 Perhaps the most significant is the Technology Package, which includes radar controlled cruise control, collision warning with full auto-brake, pedestrian/cyclist detection with full auto-brake, and Driver Alert Control, which prevents your Volvo from straying out of its lane. 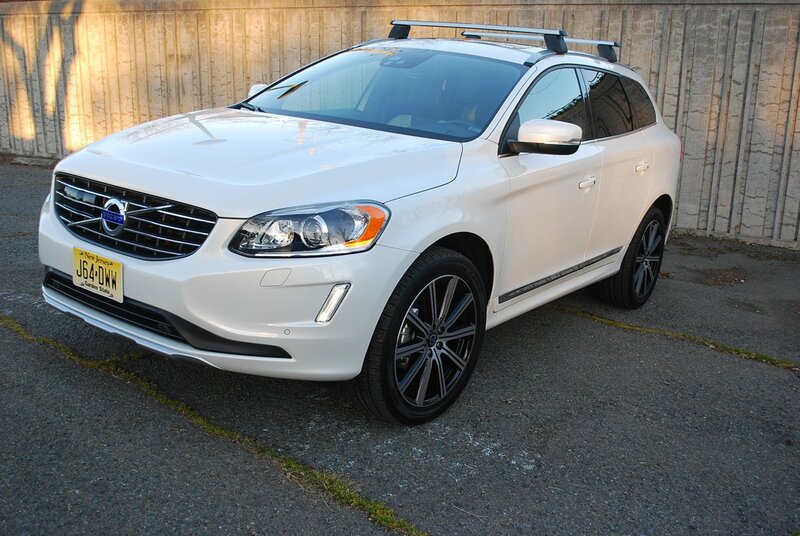 In addition, our XC60 also featured a $900 optional “Blind Spot Information System Package” (BLIS) which consisted of small warning lights on the A pillars next to the rear view mirrors that illuminated orange when traffic impinged in adjacent lanes. This proved useful without becoming intrusive. The BLIS package also includes front and rear park assist beepers. Although the XC60 has plenty of straight line punch, its handling is a notch below comparable sports utilities like BMW’s X3 and new X4, or Porsche’s Macan. The Volvo’s main weakness is its lack of precise steering feedback. In fact, even the range of vertical adjustment for the wheel itself is too limited to allow a sporty driving position. The XC’s suspension is also complicit, with too much pitch on corners, combined with too harsh shock damping over potholes. This makes for a ride that is simultaneously pitchy yet jarring. A final irritation comes courtesy of the purported Owner’s Manual, which inexplicably contains no index references to such basics as instrument location and function, or even cruise control operation. Consequently, I could never figure out how to adjust my cruise control default speed without changing it in 5mph increments.